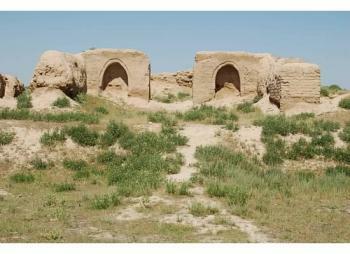 The Site of Ancient Town of Pyanjekent is part of the Tentative list of Tajikistan in order to qualify for inclusion in the World Heritage List. In May 2007, I visited from Samarkand, Uzbekistan, making a day trip visit to Penjikent, a city a few miles from the Uzbek/Tajik border -- the ruins of Penjikent were unspectacular, but the bazaar was colorful and photogenic. The trip required a double entry Uzbek visa. The overland border crossing between Samarkand and Penjikent may now be closed, so instead a visitor would be required to make a lengthy journey from Dushanbe.